The 2014-15 school year will be important for Common Core as the standards are fully implemented in many remaining states of the 43 (and the District of Columbia) that have embraced their adoption. CCSS has its advocates as well as its critics, and the debate on its merits has become more pronounced in recent months. Irrespective of the political differences with Common Core, its concepts are critical for students because the standards help with understanding the foundational principles of how math works. This guide steers clear of most of the controversy surrounding CCSS and primarily focuses upon the math your firstgrader will encounter. A stated objective of Common Core is to standardize academic guidelines nationwide. In other words, what first-graders are learning in math in one state should be the same as what students of the same age are learning in another state. The curricula may vary between these two states, but the general concepts behind them are similar. This approach is intended to replace wildly differing guidelines among different states, thus eliminating (in theory) inconsistent test scores and other metrics that gauge student success. An increased focus on math would seem to include a wider variety of topics and concepts being taught at every grade level, including first grade. However, CCSS actually calls for fewer topics at each grade level. The Common Core approach (which is clearly influenced by so-called “Singapore Math”—an educational initiative that promotes mastery instead of memorization) goes against many state standards, which mandate a “mile-wide, inch-deep” curriculum in which children are being taught so much in a relatively short span of time that they aren’t effectively becoming proficient in the concepts they truly need to succeed at the next level. Hence, CCSS works to establish an incredibly thorough foundation not only for the math concepts in future grades, but also toward practical application for a lifetime. 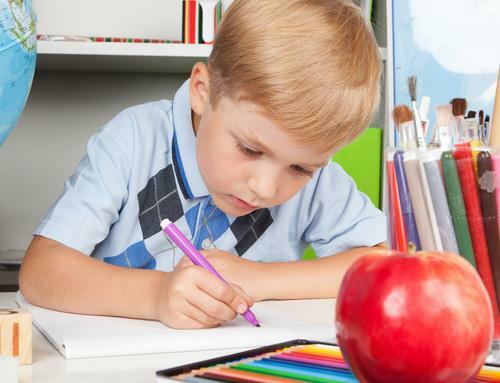 For first grade, Common Core’s focus is on addition and subtraction— the basic math facts they will use throughout their education and beyond—as well as learning how to measure without necessarily using a ruler, and how to understand shapes. Ultimately, this focus will enable children to develop rigor in reallife situations by developing a base of conceptual understanding and procedural fluency. Students will use a variety of methods and strategies to gain a full comprehension of the concepts behind addition and subtraction. Approaches include length-based models (e.g. stringing cubes together to form lengths), counting to add or subtract (e.g., 5 + 3 = 8 is the same as counting 3 past 5), and making tens (e.g., with 8 + 7, count 2 more from 8 to get 10, and 2 fewer than 7 to get 5, then just add 10 + 5 to get the answer). Ultimately, the goal for kids is to become proficient with addition and subtraction within 20. The concept of two-digit numbers as a certain amount of tens and ones is introduced and emphasized (because understanding place value now will ease the transition to threeand four-digit numbers, and beyond, in future grades). Students will learn to add within 100 and subtract by multiples of 10. Students will learn the meaning and processes behind measurement, and they will be taught iteration (mentally building the length of an object using equal-size units) and how to compare the measurements of objects. First-graders will work with shapes to understand their relationships. For example, students will learn that two triangles can be placed together to form a quadrilateral. Concepts such as congruence and symmetry are first introduced. From the four critical areas of focus discussed in the previous section, Common Core also further clarifies the skills first-graders should know by the end of the school year. For example, the fluency requirement at this level is adding and subtracting within 10. The four topics presented here, taken directly from CCSS itself, 2> include some specifics on what kids will be taught in Grade 1. Represent and solve problems involving addition and subtraction. Equations with answers within 20 are emphasized, with strategies including adding to, taking from, putting together, taking apart, and comparing. Students will also solve word problems by applying these skills. Understand and apply properties of operations and the relationship between addition and subtraction. The commutative property of addition (5 + 9 is the same as 9 + 5) and associative property of addition (3 + 5 + 7 is the same as adding 3 + 7 to get 10, then adding 10 + 5) are explained. On the subtraction side, students will learn the answer to 9 - 5 is the same as adding that number to 5 to get 9. Add and subtract within 20. This is simply more emphasis on basic arithmetic facts with answers of less than 20. Students will understand the relationship between counting and addition/subtraction, as well as learn to use strategies to help them add (for example, arriving at an easier equation to solve a problem such as turning 4 + 6 into 4 + 4 + 2). Work with addition and subtraction equations. Students will learn about the equals sign and apply that knowledge to true/false questions (e.g., true or false: 3 + 6 = 6 + 3). Also, first-graders will solve problems in which, a part of an equation will be unknown, such as in 2 +__=4 (solve for the blank). Extend the counting sequence. Students will learn to count, read, and write numbers up to 120. A two-digit number represents a certain number of tens and a certain number of ones (for example, 47 is 4 tens and 7 ones). Ten can be thought of as a bundle of 10 ones. Multiples of 10 up to 90 are the same as a single-digit amount of tens (e.g., 70 is the same as 7 tens and 0 ones). How to compare 2 two-digit numbers based on what they have learned about place value. Use place value understanding and properties to add and subtract. While learning how to add a two-digit number to a one-digit number or 10, students will come to an understanding that they will add tens and tens together, then ones and ones, and sometimes have to compose a new ten to reach the answer (e.g., 36 + 42 = 30 + 40 = 70, 6 + 2 = 8. First-graders will also be taught how to mentally add 10 to a two-digit number and how to subtract multiples of 10 (within 90; e.g., 40 - 20 = 20). Measure lengths directly and by iterating length units. Students will order three objects by length and indirectly compare the length of two objects by using the third. Also, first-graders will express the length of an object in units by using copies of a shorter object (for example, by measuring a long Lego block with smaller, equal-sized Legos). Tell and write time. Students will tell and write time, on analog and digital clocks, down to the half-hour. Represent and interpret data. First-graders will be taught to ask and answer questions on the total number of data points, how many of something are in a category, and how many more or less are in one category than another. Reason with shapes and their attributes. The difference between defining attributes (a square has four sides) versus a non-defining attribute (that square is blue!) will be taught. Students will also compose two-dimensional and three-dimensional shapes and partition circles and rectangles into two or four equal shares, learning the terms halves, fourths and quarters along the way. Common Core aims to improve educational performance and standardize what students should learn at every grade in preparation for a lifetime of application, but it does not set curricula, nor does it direct how teachers should teach. As with any educational reform, some teachers, schools, and school districts will struggle with CCSS, some will seamlessly adapt, and some will thrive. As a parent, your responsibility is to monitor what your first-grader is learning, discover what is working or isn’t working for your child, and to communicate with his or her teacher—and to accept that your children’s math instruction does differ from what you learned when you were younger, or even what they might have learned last year. The transition can be a little daunting for parent and student alike, but that’s not a product of the standard itself. Common Core simply takes a new, more pointed approach to improving the quality of math instruction in this country. Finally, CCSS links standards from grade to grade so that the skills learned at one level translate into the tools they need to learn at the next level. This coherence would seem an obvious educational approach, but often, there is no link—students are taught a skill in first grade that might not be used (and might have to be re-taught) until third Each new concept in Common Core is an extension of a previous, already learned concept. In addition to the grade-specific standards it sets forth, Common Core also emphasizes eight “Standards of Mathematical Practice” that teachers at all levels are encouraged to develop in their students.3 These eight practices, designed to improve student performance, are described here, with added information on how they apply to first-graders. Make sense of problems and persevere in solving them Students explain the problem to themselves and determine ways they can reach a solution. Then, they work at the problem until it’s solved. This CCSS math practice encourages students to take their time to read and try understanding the problem, emphasizing that the process is ultimately important even if it doesn’t result in a correct answer. This initiative is particularly crucial for first-graders, who are just learning to read and might naturally proceed slower while trying to solve a word problem. Students this age will also be encouraged to use pictures or objects to better visualize the problem and solution. Reason abstractly and quantitatively Students decontextualize and contextualize problems. By decontextualizing, they break down the problem into anything other than the standard operation. By contextualizing, they apply math into problems that seemingly have none. For example, first-graders may decontextualize an addition problem by using their fingers to arrive at an answer. Children this age who are contextualizing may see a picture with eight objects and visually break the image into two groups of 4 and 4 of the object. Construct viable arguments and critique the reasoning of others Students use their acquired math knowledge and previous results to explain or critique their work or the work of others. First-graders might still be learning to read and write well, but they do know how to express themselves and may jump at the chance to answer a question out loud. Besides boosting their confidence, the ability to explain the math will increase their ability to excel at it. Use appropriate tools strategically Another self-explanatory practice: Students learn and determine which tools are best for the math problem at hand. 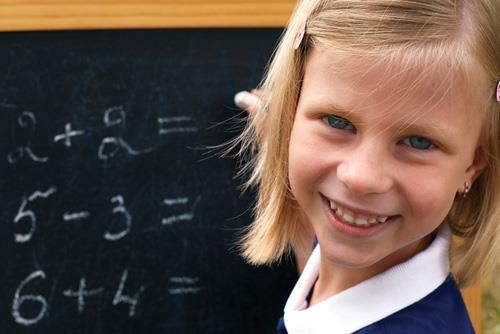 In first-grade, children will be taught so much arithmetic that knowing and using the appropriate symbols and signs (e.g., plus sign, minus sign, equals sign, and so on) is vital. Attend to precision Students strive to be exact and meticulous—period. As the focus in first grade turns toward mastering basic math facts, arriving at correct answers by any way possible takes on added importance. Furthermore, if a student can’t come up with the right answer on a more complex problem, he should be taking steps to figure out how to solve (e.g. recognize place value: ones, tens, hundreds) or should ask for help. Look for and make use of structure Students will look for patterns and structures within math and apply these discoveries to subsequent problems. For example, first-graders who understand the bundling of tens might use that knowledge to easily add 11 to something (just add 1 to the tens place and 1 to the ones place). Look for and express regularity in repeated reasoning Students come to realizations—“a-ha” moments is a good term for these realizations—about the math operations that they are performing and use this knowledge in subsequent problems. For example, a firstgrader might realize that adding 2 to an even number results in another even number, then use that knowledge to help develop her addition skills. A basic tenet of Common Core is to apply math principles to real-world situations. Why not start now? Give your child math problems when you are out and about—the store, in traffic, the park, and so on. For example, if your first-grader plays soccer, have her separately count the players on your team and on the other team and tell you how many kids there are total. If your first-grader is struggling with the new math standards, talk with his or her teacher first. You then might want to seek outside resources to help your child. Several online resources provide math help, including worksheets and sample tests that conform to Common Core standards. Tutoring might be an option you consider as well. Innovative iPad-based math programs have emerged that combine the personalized approach of a tutor with today’s technology. This revolutionary approach also may feature a curriculum based on Common Core, thus ensuring your child’s learning at home is aligned with what he or she is learning at school. Megan bought 5 ice cream cones and 4 ice cream bars. How many total ice creams did Megan buy? An artist painted 5 pictures on Tuesday, 3 on Thursday and 9 on Saturday. How many pictures did he paint? Alice bought 13 bulbs. She gave 5 away to her friend. How many bulbs does Alice have now? How many tens are in 73? Jack’s house has 30 lights. If 10 of them are not working, how many lights are working? Megan’s pencil is longer than Andy’s pencil. Andy’s pencil is longer than John’s pencil. Whose pencil is the longest? How many paper clips equal the length of the flag? Ria’s school starts at half past eight. Enter the answer in hh:mm format. Enter the answer in hh:mm format. In an office, lunch time is at half past twelve. John’s Math class is half hour long. It starts at 11:00 am. At what time will his class end? Count the total number of cupcakes Susan went to the market and bought the items shown below. How many total items did she buy on Monday? Kate counted the different birds in a garden during different weeks and noted down her observations. In which week did she observe the least number of birds? A baker sells the following over the weekend. How many ice cream cones did he sell over the weekend? How many straight lines does the image have? I have no flat faces and when you look at an orange, you will remember me. What shape am I? Select the shapes that you can make with 4 triangles. How many parts is this shape divided into? Select all images that represent half a rectangle.